I decided to try using Calamity. Looking at my decklist you might wonder why I included so many one-cost units (twelve in total), and it is because I would not always get a copy of Calamity to hand, and if I did have the opportunity to use it, the harm to myself will be lessened than if I used two-cost units. The only two-cost unit I have is Warlock Destructor, and after combat you usually do not care what happens to them (I do not normally pay their upkeep cost the following deploy phase). Needless to say, Calamity’s position in my deck will require more playtesting, but against some opponents it will be a total blowout (for example, against Coteaz). Ku’gath is a tricky warlord to fight against; the ever-present threat of Fetid Haze looms over you. Luckily for me, Eldar have a great tool to fight against it; Nullify. My plan was to not engage Ku’gath in any serious battles until I had a Nullify in hand (obviously this is not sustainable, but I was going to hold off as long as possible). Thanks to my swarm of cheap units I was able to do well in the command phase. As an aside, another card to watch out for is Inquisitor Caius Wroth (luckily for me, my opponent never drew one during the game, but it turns out that he had three in his deck!). This guy can totally ruin your day if you are playing a command-focused deck, and in my opinion is pretty much an auto-include for any deck that is weaker on command, such as Chaos, Orks and Astra Militarum. The game was going to be a short one thanks to the planet lineup. At the final battle Ku’gath committed with two Ku’gath’s Nurglings, while I sent Baharroth to the second planet then used Mobile to move him over. During that battle I used Nullify against his Fetid Haze, which he really needed to go off to try and win (not just the healing effect, but also the damage). This game was recorded so video footage of it should be available soon so you can see the play-by-play, but I will add some of my own commentary as well. I made a terrible mistake on the first turn by not leaving my Warlock Destructor in the battle to die, which would have made us even on the total number of units, stopping him from activating Tarrus (which he did twice that turn!). The arrival of Inquisitor Caius Wroth was a bit annoying, but not game-ending as I still had a good hold on the command phase. I made another massive mistake by using Baharroth’s mobile to move over to the first planet when I had committed him to my game-winning planet. My aim was to do some damage and then get out of there, but my opponent had more combat tricks than I had anticipated and I ended up wasting valuable resources and cards on a fool’s endeavour. I honestly think that if I had not bothered with that move that I would have won on the next planet. Lesson learned! Fair play to my opponent though, he definitely knows how to use Nazdreg (he is the guy that went 5-0 in the swiss part of the regionals at Stoke). As an aside, at this point in the tournament all three of the Shadowsun players were 0-2. Poor Tau! A Baharroth mirror-match was going to be a tough one, but would pretty much come down to who did better at the command phase since both decks would have similar combat ability. I managed to get an early lead on this, then during the second turn’s headquarters phase I used Calamity; it bounced my Void Pirate that was currently at HQ (it had been routed with Ferrin), my opponent’s Warlock Destructor that was at the first planet, and both of his Eldar Survivalists. It only left my Baharroth’s Hawks in play at planet two. My opponent was currently 3-0 and a win in this game would wrap up the tournament for him. Cato is a difficult warlord to play against with a deck focused on command because he can generate resources outside of the command phase. The planet lineup was such that the first four planets shared a colour. This meant that the game was going to be aggressive. Thanks to a combination of Warlock Destructor, Archon’s Terror and Gift of Isha, I was able to win the first two planets. On the third turn my opponent had to ensure that I did not win the first planet, so had two Honored Librarians there. I ceded the planet to him and set up at planet two. The following turn I used Doom to get rid of all his forces at his HQ, which made the battle at planet one a no-contest. As you can see, the top three were all on 15pts, so it came down to tiebreakers. Rather amusingly, I had beaten the Cato player, who had beaten the Nazdreg player, who had beaten me! Next tiebreaker was strength-of-schedule (the sum of our opponent’s points), where myself and the Cato player were identical. The next tiebreaker was our opponent’s, opponent’s strength-of-schedule, where I lost out basically because someone played against the 10th-placed player! Very close though! So I nearly won the tournament but just lost out on tiebreakers. Really enjoyed using Baharroth, but not sure if I prefer him over Eldorath Starbane. Mobile was really useful, but his signature unit felt a bit lackluster (I guess that I am spoiled by how good Starbane’s Council is). Calamity is something of a contentious choice, but the one time that I used it, it effectively sealed the game for me. As I have stated in the past with certain cards, even if you only use it one-in-four games but it finishes off the game for you, then it is probably worth including. 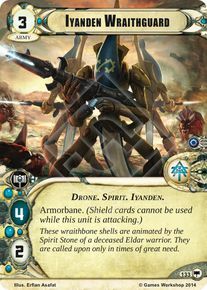 My MVP for the tournament would probably have to be Iyanden Wraithguard. The four Armorbane damage is hard to beat and it is also a great card to bring back into play with Gift of Isha. In some of my previous Eldar decks I have omitted the Wraithguard, but since I have full sets of both two-shield cards it is easier to keep in play long enough to hit something. This week we saw lots of Space Marines and lots of Tau (but no Aun’shi), with no Dark Eldar in sight (except for my couple of allied cards of course). This will of course change as we have a rule for our league that you cannot use the same faction more than once. With the Tyranids on the horizon it will add another faction to our list of choices. Up until now I have only been writing articles for Conquest, but I am going to be writing things about the other games that I play as well (but probably still with the main focus on Conquest), hence the change of host to The Games Store (my LGS). Anyway, hope you enjoyed the report!